ROCKY MOUNTAIN NATIONAL PARK—There’s never a good reason to be woken up at 2AM. Phone call, alarm clock, knock at the door…it’s all jarring, unexpected, and unwelcome. You’re not in the right frame of mind to do anything at all at this hour, especially when you’ve been asleep. Well, maybe you’ve been asleep. You can’t really tell…you’ve been tossing and turning, woken up every twenty minutes by headlights and the slamming of car doors, nervously hoping it won’t be a park ranger tapping on your windshield, summoning you out of the car. After all, you are parked next to a sign that says, “No Camping in the parking lot—strictly enforced”. But it’s the most logical place to stay when you’re voluntarily awakening at this most ungodly of hours, so that you can roll out of your sleeping bag, kick on your hiking boots, grab your bag, and hit the trail. I’ve been in a funk lately. I’m at one of those points in my life where many things are up in the air—I have a free spirit and endless amounts of time to adventure, but I don’t know what I ultimately want to do, or where I want to live. I’m figuring it out, but I’m constantly back and forth. I’m at a series of turning points in my life, and it can be overwhelming at times, making you feel as if you have no control over things. Yet there are some things in life that are definitive—that you do have control over. They are binary, things that you have either accomplished, or not accomplished. I once read that man is at his worst when pitted against fellow man; he is at his best when he is pitted against nature. Sometimes, the inner strife, the constant battle over what to choose to do with your life can be overwhelming. It’s a struggle within yourself, but also with others. With those who review your job applications, and with those you work with. With those you socialize with, and with those you live with. Turmoil between man is messy; turmoil with nature is clear-cut. Sometimes, you just need to go climb a damn mountain. This summer, I’ve had a list of things I want to do. I found myself in Colorado with an adventure-mobile—my trusty Sexterra—and a wacky schedule lending itself to short bursts of adventure, which, of course, only I have the free time for. So I’ve found myself camping and hiking, making bonfires and exploring, all over the state. On the list was a visit to Rocky Mountain National Park, a mere hour and forty minutes away from Steamboat. And within it, Long’s Peak, one of the most notable mountains in the Front Range of Colorado. A doable climb, so the website says. A climb that doesn’t require technical gear but is challenging, and potentially deadly. A challenge, versus nature. A clear-cut, black-and-white mission: to climb Long’s Peak, or not. Do or do not, there is no try. At times like this, it can be deliciously satisfying to focus your efforts on a problem wholly unrelated to the source of your personal angst. On a problem that is difficult, yet one you can tackle, which requires dedication, strength, and the will to succeed. Platitudes, perhaps, but worth executing once in a while. Sometimes, this is just what you, and your psyche, require. A reminder that you are capable of tackling a challenge, of saying I want to accomplish this, and setting the proper plans in motion to let you do so. The only thing that stands between you and success is your own willpower. That, and the threat of an early-afternoon thunderstorm: hence the 2AM wake-up call. I’m not going to lie; as I was nestled into my little nook in the back of my car, staring up at the sky, I saw it clouding over. I had no idea what time it was, but the thought crossed my mind that maybe I should bag the summit attempt. The weather forecast the night before had said there was a 5o% chance of thunderstorms by 7AM, but the forecast in the mountains is notoriously unreliable. But there was something inside me which simply wouldn’t entertain the notion of quitting right there. If I made it far enough where I could push for the summit, then sure, maybe I would call it off if the weather looked ominous. But not here, not now. 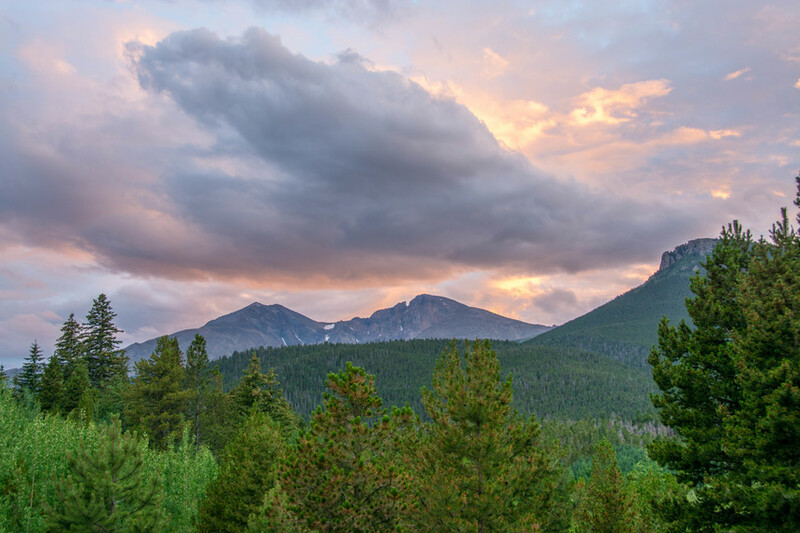 Long’s Peak is a seven mile hike from the trailhead, beginning innocently enough, but it quietly stretches on and on, and in the darkness of the night you have no sense of the overall direction of the trail. It’s foot in front of foot, hour after hour. There is a sense of weariness in the repetition, but it’s not one you dwell on. Your mind is focused on the big picture, on the summit. I surprised myself with how fit I’ve become here in Colorado, where everyday life involves running, hiking, biking, kayaking, etc. I don’t go to the gym all that much, but I don’t need to. It also doesn’t hurt that I sleep at 6500 feet. I’m acclimatized already. I’m in shape already. I didn’t need to train for this. But acclimatization doesn’t help at 12,000 feet. At 12,000 feet, the climb becomes difficult. I can feel the affects of the altitude; I need to rest more frequently, and take deliberate, deep breaths. For no reason at all, the terms HACE and HAPE keep running through my mind—short for High Altitude Cerebral Edema and High Altitude Pulmonary Edema. I don’t feel the effects of either; this is simply a byproduct of reading too much Jon Krakauer. Either way, I’m acutely aware that these are real afflictions; that a group of Green Berets needed to be evacuated from this very mountain only a few short months ago, albeit in far more wintry conditions. The thought of turning around crossed my mind, especially as the climb became more difficult, and the precipices more noticeably unguarded. People have died climbing Long’s Peak, and likely more will die this season. But I take comfort in the fact knowing that I am physically fit, prepared with what I need to keep my body healthy, and willing to listen to any sign, either internal or external, that I’m in danger. When you hit a certain point, there’s simply no option but to forge ahead. Some call it summit fever. While I didn’t exactly have the fever this morning, there was no doubt in my mind that I was reaching the top. Sure, I’ve been in a funk. These things will pass, they usually do. Usually, you regain control, things start going your way, and you get over it. 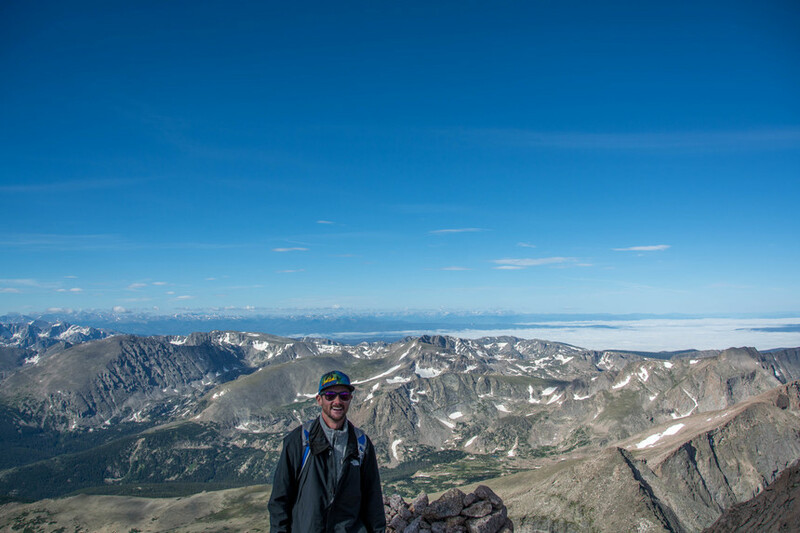 But summiting Long’s Peak, now, that was one thing within my grasp. That was one thing that I could either accomplish, or not accomplish. I was not pitted against my fellow man, in essence, I was pitted against myself. You are capable of climbing this mountain, I told myself, and it’s only a matter of allowing yourself to do so. The summit was somewhat anti-climactic. The size of a football field, it’s impossible to get any sense of 360 degree views, which is what most people expect when they reach the top of a mountain. I could see the clouds over Lake Granby, miles and miles away…but I had already seen that, passing through the Keyhole on my way up. I could see Denver, off in the distance, but I had already seen that too…on my approach, as dawn overtook the city. There was nothing particularly special about this summit, aside from the fact that I had reached the summit. I had set out to do so, and I had done so. It took me six hours to reach the top. It took me five and a half hours to descend. That’s not normal, but Long’s Peak is not a normal mountain. 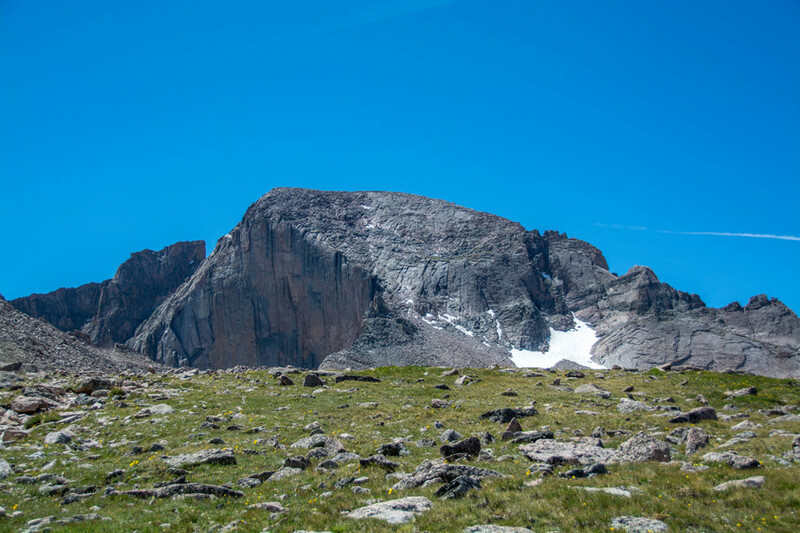 They don’t call them the Rockies for nothing; everything above 11,000 feet is just that…rocks. Boulders. Which are indistinguishable from Earth on an ascent, but far worse on your knees and quads on the descent. All in all, I was hiking for a bit over 12 hours, almost non-stop. The Health app on my iPhone (take that for what you will), calculated 20 miles over the course of the day, a figure I consider accurate. Right now, I’m hurting. My legs hurt, my brain hurts. I’m tired. I barely slept last night, and I’ve been up since 2AM. I’m battered, bruised, and broken. OK, not really. I’m just pretty hungry and enjoying having a seat. But I’m also victorious, because I made it to the top. I did something that was difficult, but eminently within my control to accomplish. Sometimes, you’ve just got to go climb a damn mountain. What will yours be?